The intersection of Telegraph Avenue and 55th Street looking north, circa 1947. From the collection of John Harder, courtesy of Ray Raineri. Horses tethered to wooden cars hauled loads along rail lines laid out across Telegraph Avenue, the main thoroughfare in Temescal. Pedestrians dodged slush pools and mud-filled ditches as they walked. And saloons cropped up alongside the rail lines, with raucous crowds moving between them, threatening to break out in brawls. This was Temescal in the early 1870s—a small, green suburb next to the City of Oakland that was rapidly becoming busier with traffic passing through it. The influx of commuters had come with the Oakland Railroad, which originally ran from the foot of Broadway to Temescal bridge (now where 51st Street and Telegraph intersect), but was extended all the way to Berkeley when the College of California (now University of California, Berkeley) moved its campus from Oakland to Berkeley in 1873. 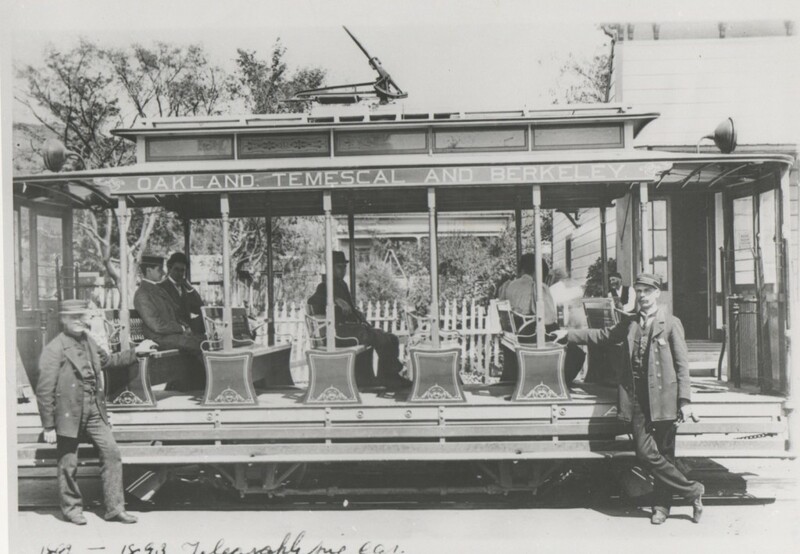 With an extra fare of 25 cents for four rides, students could take the additional 30 minute journey from Temescal Creek to Berkeley in the brand new Kimball cars the Oakland Railroad Company acquired. The arrangement was hailed as revolutionary at the time—the cars travelled at a maximum of 10 miles an hour, and left Temescal Creek every 30 minutes. A turntable at the junction at 51st and Telegraph allowed travelers to continue without waiting for the horses to be unhitched – they simply walked down a raised platform to change cars for the second leg of the journey. “51st and Telegraph has always been the commercial hub, the nucleus of Temescal,” said 72-year-old Ray Raineri, a third generation Temescal native and history buff who now lives in Martinez. “The mud sloughs and adobe chasms that abound in that thoroughfare make us gnash our teeth in rage when we hear of taxpayer’s boots and shoes becoming hopelessly imbedded in the native soil of that long-neglected avenue,” the report said. But the condition of the road was not the only painful detail of the journey – it was common for fights to break out, and one harrowed driver named Louis Siegriest admitted to carrying brass knuckles on his trips, “just in case” according to the Oakland Tribune. A fight between the San Francisco roughs and passengers in one of the cars at Temescal instigated a debate about whether the suburb should be incorporated into the main city, the Tribune reported. A policeman had been on board the car, but had done nothing to stop the fight because it was out of his jurisdiction. While the culprits were apprehended when they reached Oakland, the Oakland Transcript suggested that the burgeoning suburb should be made a part of the city in 1872, so it would come under its municipal code and benefit from its police and schools. But Temescal remained separate from Oakland until 1897. 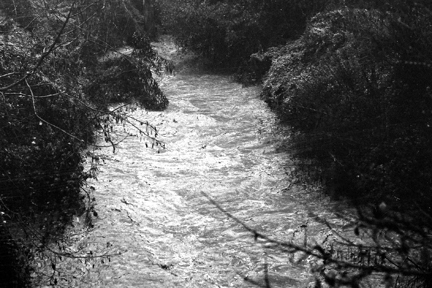 In 1875, two years after the introduction of the Berkeley line, a steam dummy line was established between Temescal and the College of California. Ten years later, Senator James G. Fair’s South Pacific Coast Railroad took over that line. Some of the changes Fair proposed, though, were mostly resisted by the community and met with derision – local papers described his proposal to extend the line eastward to San Joaquin Valley as a “threat,” and the plan never materialized. Fair also changed the tracks in Temescal to a narrow gauge version in order to accommodate a regular steam train, which also was a source of disappointment of the locals, who thought the train was loud and a source of pollution. Fair hitched horsecars to the steam train to fool people into thinking it was not running on steam, but that little contrivance did not work, and only angered the locals. He did however, link the railroads to a flourishing business in the area – he devised a contract with J. Lusk Canning Company to supply the factory at Temescal with fresh fruit, and laid out a new branch of the narrow gauge track that began at Telegraph and Vernon Street. For years afterwards, the line continued to supply fruit to the factory, propelled by gravity on its journey downhill, until the cannery closed and was replaced by a brewery in 1911. This open-sided model was among the earliest electrified streetcars to operate on Telegraph Avenue. It had lights on the rooftop for night running. It is pictured in 1892 at the corner of 51st and Telegraph, in front of the building that now houses Pizzaiolo and Bakesale Betty's. Photo courtesy of Ray Raineri. Fair sold the line to the Pacific Improvement Company two years after he bought the length of railroad around Temescal and Berkeley. The PIC fell under the leadership of the Southern Pacific, headed by Charles Crocker, Leland Stanford, Collis P. Huntington and Mark Hopkins – the celebrated capitalists known by the moniker “The Big Four,” who built their fortunes from the California railroads. They replaced Fair’s steam engine with the steam dummy line, which remained in service until the railroads were electrified in 1892. But until Francis Marian “Borax” Smith took over the railroad right before 1900, the railroads had a fractured ownership. “Lots of different people owned a mile here, a mile there, a line here, a line there,” Raineri says. Smith and his partner, Frank Havens, both “thought on a huge grand scale and they both had a lot of money.” With the introduction of two new lines in 1904 and 1911, the partners made sure that two new north-south street car lines ran across Temescal, and two transbay commuter lines. “You could get anywhere in the bay area from here,” Raineri said. 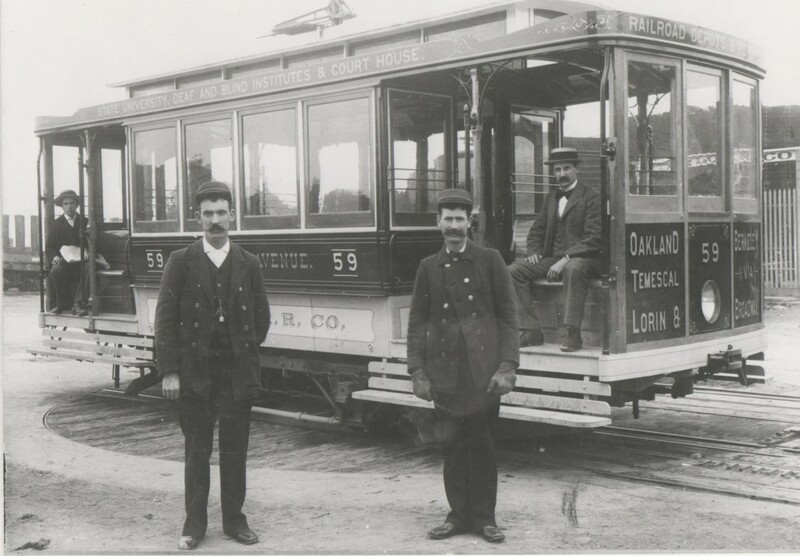 Posing for a snapshot in Temescal, the operator and conductor of this early six-bench open trolley strike a casual stance. The passengers inside await a ride into downtown Oakland. Photo circa 1892, courtesy of Ray Raineri. This open-sided model was among the earliest electrified streetcars to operate on Telegraph Avenue. It had lights on the rooftop for night running. It is pictured in 1892 at the corner of 51st and Telegraph, in front of the building that now houses Pizzaiolo and Bakesale Betty’s. Photo courtesy of Ray Raineri. How did the geographical boundaries of Temescal change over the years?